Carl is a frined of mine that I have know for many many years. He is an awesome family man and traveler. Here is his story. We begin this story at a local fast food restaurant in early 2007. Brian and I usually find ways to occasionally have lunch together on one of my days off. It’s become kind of a nice custom, especially now that he has moved out on his own. On this day the conversation took on its’ usual air of sports, except somehow or other, the subject of his travel club membership came up. I quizzed him about it with great interest and he pointed out to me that it was a family membership. Not much else was made of this and the usual father and son chatter continued. In the meantime, Matt the younger of my two sons, found himself preparing to face the home stretch of his high school days. Looking back on his high school experiences, his time on the golf team seemed pretty special, despite not always seeing eye to eye with the coach. I’ve always wondered what playing golf on Arizona desert courses would be like. The sheer beauty of these courses is enough to make any golfer a little envious. At my computer one evening, Brian had stopped by and mentioned that there would be a possibility he could get access to a luxury condo in Arizona for only $200 for the week. And so, with that revelation, the planning stage for a one week golf getaway kicked into full force. Everything from that point just seemed to fall into place for all of us. Both Brian and I had a week’s vacation coming, and Matt was able to get off from his job at the golf course. Saturday the 16th was finally here, and it was early rising to make an 8:40 AM flight. This was listed as a direct flight but did result in a stop over in Detroit. Other than our brief stop, the flight was truly uneventful. At 1:40 PM MT (11:40 AM EST) we landed at Phoenix’s Sky Harbor Airport. As we were taxiing to the terminal, the thought of what the Arizona climate was going to feel like kept my mind well occupied. When we finally stepped into the long hallway to the terminal from the aircraft, the heat felt no different than a hot summer day back in Maryland, but that would soon prove to be a mere deception from Mother Nature. As we were being chauffeured to get our rental car, we got our first look at the Arizona countryside. While on the freeway I noticed that cactus were in abundance and very much incorporated into the well manicured roadside landscaping. Bridges were constructed of sand colored concrete with the typical native Indian décor designed directly into them. 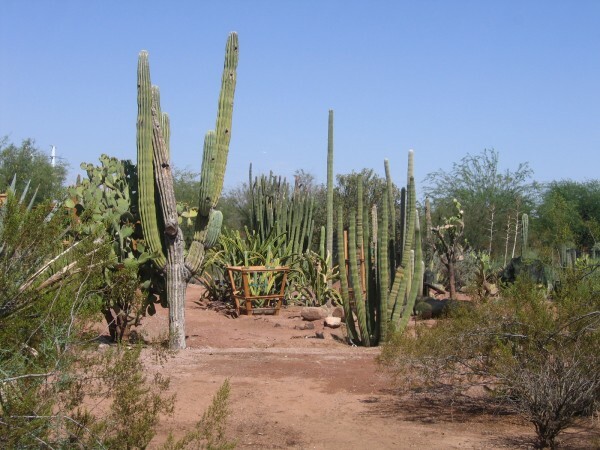 Our original itinerary called for us to visit the Desert Botanical Gardens once we arrived, as our scheduled check in time to our resort condo was much later. Almost unanimously everyone started talking food, and the decision was made to take in lunch first. Once filled and content, we headed to the Botanical Gardens, where we truly began experiencing the Arizona climate. Armed with our water bottles and cameras, we began exploring the gardens and their natural beauty. After our scenic tour, we headed to check into our condominium, which was located north of downtown Phoenix. The condo was very spacious and had everything one could want. A washer and dryer, fire place, cable, three bedrooms, two bathrooms, and two balconies. The master bedroom had its’ own bath and balcony. Seeing as Brian had picked up the lodging tab, it was only right that he enjoy the master; besides a bed is just that, a bed! Once unpacked and settled in, we firmed up plans and decided to go shopping for necessities, such as snacks and bottled water, which we would definitely need when we set out on the golf courses. We woke up Sunday to find a beautiful day awaiting us, and as we anxiously prepared to go out and hit the links, I thought to myself how great it was spending Fathers’ Day golfing with the boys. We had a tee time of 10:32 am at a course called The Duke, which is located in the town of Maricopa, about thirty miles southwest of Phoenix. After checking in for our tee time twenty minutes early, we managed to grab a quick snack, and before we knew it we were in our carts and ready to play. Because of the heat, golf carts are equipped with mini coolers, and are filled with ice by the attendants in order for golfers to keep their drinks cold. Before we headed out to play, the starter went over the dos and don’ts of the course. We were encouraged to bring enough spare balls, because any that wound up out of bounds were not always easy to find or retrieve. We were told that unless a ball is readily reachable, we should stay in the immediate area of the course. He also said we should use clubs to reach under plants and bushes, because this was a ’living desert’ and creatures of all kinds could be living in them. The first hole was upon us and it took on a very different flavor than the traditional ones we often play. Grass was only in areas such as tee boxes, fairways, and greens; all other areas on the course was desert terrain. All I could think of while I stared down range ahead of me was hitting the ball far enough to make the fairway. Our visit to Maricopa and The Duke was a great one, and it was now time to head home and get some relief from the one hundred degree plus heat by jumping in the pool located just outside our door. Believe me, it turned out to be our best friend throughout the week. Once cooled off and cleaned up, we headed into downtown Phoenix for dinner. Ever since we arrived in Arizona, Matt & Brian had talked about going to the greyhound park. We took our well fed bodies and headed for the Phoenix Greyhound Park, which is located not far from downtown, just beyond the airport. The boys enjoyed themselves immensely, despite losing a few bucks between the two of them. Not being a bettor, I simply sat and enjoyed watching and taking pictures. I will always look back on this Fathers’ Day with great fondness and many wonderful memories. The fact that this special day didn’t seem to buy me any breaks from either of my ultra-competitive opponents, and it was every man for himself as usual; turned out to be more fun than I could describe or ever hope for. 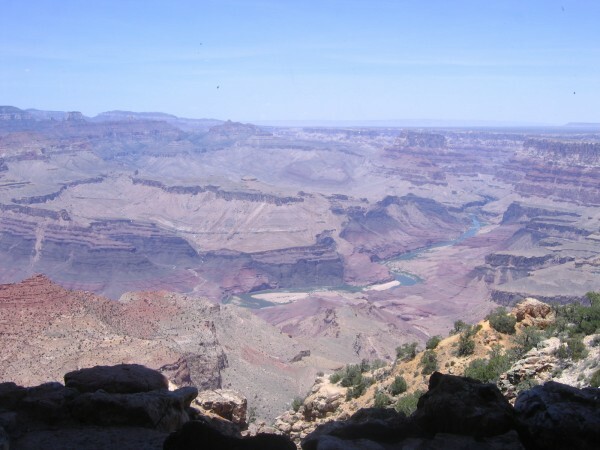 On Monday the 18th, we embarked on the mother of sightseeing trips on our itinerary; The Grand Canyon. Our journey would bring us up Interstate 17 to US route 89, and eventually on Arizona State Highway 64, which runs along the south rim of the canyon. As we traveled north, we couldn’t help but notice the changing terrain. The desert appearance slowly gave way to very rocky plains the farther north we went. The highway ran by and cut through majestic mountains as they began revealing cliffs and canyons around every turn. As the cactus began to slowly disappear they were replaced with brush. Eventually we reached the town of Cameron and turned onto Arizona Route 64 where we began the final thirty miles of our journey. At one point we came to the actual entrance of the Grand Canyon National Park. 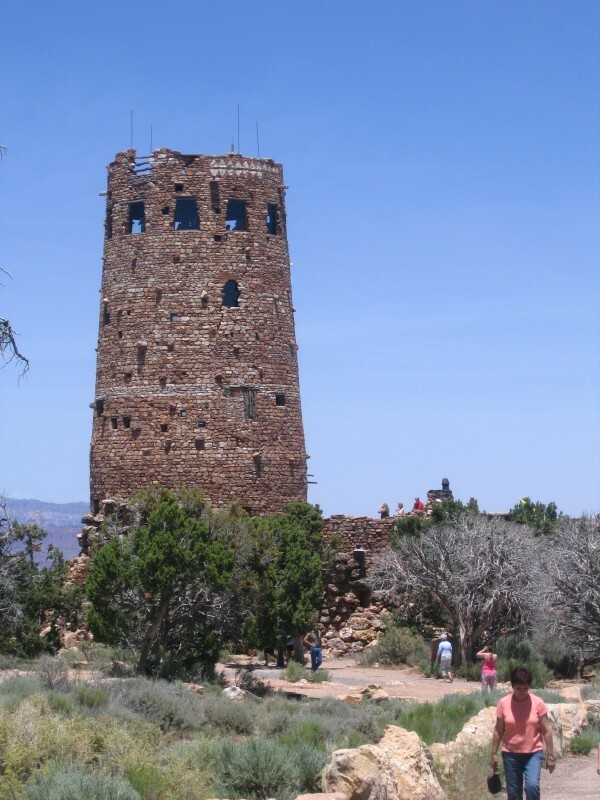 From there we continued and found several scenic overlooks along the road leading to the town of Grand Canyon, our intended destination. Driving along, we noticed a stone tower in the distance. As we closed in on it, we discovered it was a gift shop and a lookout point. It was at this site that we got our first full fledged glimpse of The Grand Canyon and its’ overwhelming splendor. As Brian simply put it ‘no camera can do it justice’. We all just stood there in awe when realizing that this was actually a product of nature and not man. The choice to visit The Grand Canyon was a good one, as all of us seemed impressed in one fashion or another. Seeing the canyon was definitely a high point on the trip for me. Once safely back at the resort, we took the time to dive into the pool and escape the local heat. Being relatively early in the evening, we decided to drive to nearby Scottsdale to do a little sightseeing and have dinner. We headed back to the condo around 10:30 PM, realizing that another day of golf awaited us in about ten hours or so, and a little sleep seemed to be just what the doctor ordered. On Tuesday, armed with our daily ration of bottled water, we set out for our second day of desert golf. By this point on our trip, we were well mastered in the art of staying hydrated. Our tee time was 10:40 AM at Gold Canyon – Sidewinder Golf Club in Gold Canyon, AZ, located a few miles east of Scottsdale. This particular course proved very scenic, and we all enjoyed playing it very much. In my opinion, it was the most desert-like of the three we would play. It featured interesting holes, challenging fairways and just a great golfing experience, as a whole. Before we knew it, the 18th hole was behind us and another great day on the golf course was over. As usual, Matt had the best score, Brian had the farthest shots, and me…..well, I just simply had fun! Because of our busy schedule the first three days, we rewarded ourselves by sleeping in on Wednesday. Around 1 PM, we arrived at Out of Africa, which is a wild animal sanctuary located in Camp Verde, about half way between Phoenix and Flagstaff. The park features giraffes, lions, cheetahs, tigers, and other African animals. 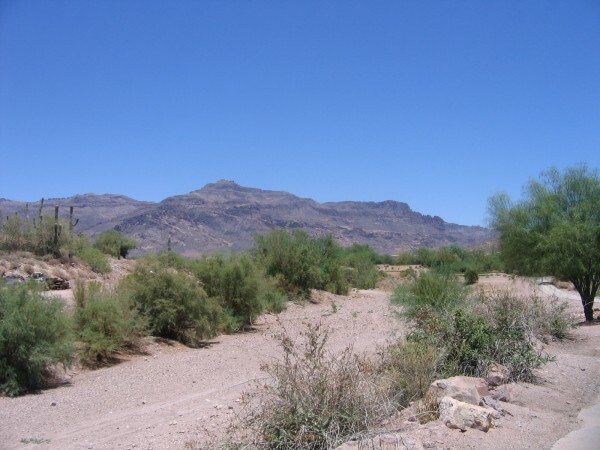 The desert climate of southern Arizona makes this refuge an ideal natural setting for seeing these wild animals. Around 4:30 PM we concluded our visit and left Camp Verde to return to Phoenix. Along the way we all decided to try and find a seafood restaurant for dinner. Pappadeux had a menu that would stimulate any seafood lover’s palate. When ordering appetizers, an unusual selection on the menu caught our eyes: fried alligator. Brian and Matt liked it so much that they brought home an order to have for breakfast Thursday morning. Day 6 of our trip featured our last golf outing on the schedule. This one would take us north of the city about 20 miles to Cave Creek, Arizona for a 10:26 AM tee time at Dove Valley Ranch, an extremely attractive course set nicely amongst the desert rolling plains, surrounded by well kept and nicely landscaped homes. After golf, we cleaned up and cooled off before heading into town for dinner at Alice Cooper’s Cooperstown Restaurant. Friday was to be our last complete day in Arizona, so we scheduled a little something special. 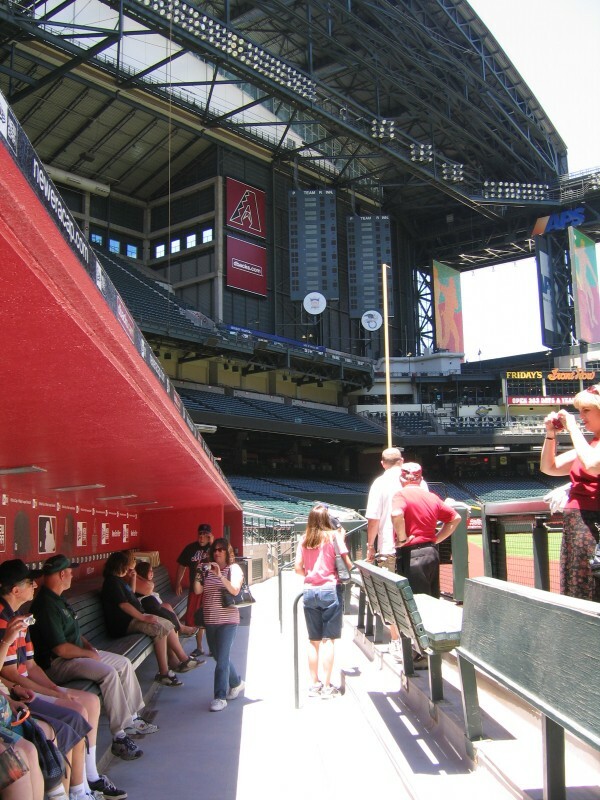 In the morning we went to Chase Field, to take the stadium tour of the home of the Arizona Diamondbacks. After lunch we did more sightseeing in downtown Phoenix and when evening came, we found ourselves at the stadium once again for a game between the D’backs and our own hometown Baltimore Orioles. We headed back to our condo for the last time and began preparing our departure the next day. To say that time flew by would be a huge understatement. Our flight today was scheduled to take off at 1:40 PM MT and arrive in Baltimore at 9:05 EST. We arrived at Sky Harbor a little early, and once we were checked in and cleared security, we decided to grab something to eat before boarding. A little after 9PM we finally landed at BWI, and that marked the end of what proved to truly be a trip to remember. Tower at the Grand Canyon South Rim above.